With 2018 models quickly arriving and ushering out older model vehicles, there is no better time to swing by DePaula Mazda and check out our inventory of 2017 Mazda 3’s. Available as either a sedan or a hatchback, the 2017 Mazda 3 offers drivers a the chance to own a speedy, well-appointed and comfortable car for an extremely reasonable price. If you aren’t familiar with the popular model, we are positive that you’ll be impressed by the performance, craftsmanship and safety ratings of the 2017 Mazda 3. The 2017 Mazda 3 is powered by a 2.0-liter four-cylinder engine that cranks out 155 horsepower. Even with just the standard engine, the 2017 Mazda 3 is a speedy little number that offers drivers plenty of zoom zoom, although for those who need the extra pep Mazda offers a 2.5-liter four cylinder engine that gets 184 horsepower. However, the stronger engine is only available on two trim levels: the Touring 2.5 and the Grand Touring – so unless you’re an extremely sporty driver, you’re probably just fine sticking with the base engine. No matter which engine you ultimately opt for, you’ll get great fuel economy out of your 2017 Mazda 3. The standard 2.0-liter four-cylinder gets 28 miles per gallon in the city and 37 mpg on the highway when coupled with the six-speed automatic transmission, while the 2.5-liter engine puts up nearly identical numbers – 27 mpg in the city and 37 mpg on the highway. As if the 2017 Mazda 3 wasn’t financially-friendly enough, you’ll be happy to keep racking up the savings as you cruise right past the gas station. The 2017 Mazda 3 is technically offered in four trims, but one of those trims – the Touring 2.5 – is only offered available on hatchback models. While even the top of the line Grand Touring remains under $25,000, buyers who opt for the base model Sport certainly won’t be disappointed. The 2017 Mazda 3 Sport is equipped with cruise control, keyless ignition, Bluetooth functionality, two USB ports, an auxiliary jack, HD Radio and a six-speaker sound system to play all of your tunes from. Additionally, the Sport has a tilt-and-telescoping steering wheel, a 60/40-split folding rear seat, a seven-inch touchscreen display and is voice-control enabled. That’s a lot of bang for your buck – especially as the starting MSRP for the 2017 Mazda 3 Sport sedan is just $17,845. Choose to go with the hatchback model and you can bump that price up just slightly to $19,095. If you’re willing to spend a little more money, you can add in the Preferred Equipment package which will add automatic headlights, automatic windshield wipers, heated side mirrors, a rear seat armrest and blind-spot monitoring with rear-cross traffic alert. Or, at that point, you could just move up to the Touring trim. The 2017 Mazda 3 Touring encompasses not just the goodies in the Preferred Equipment package; it also includes keyless ignition and entry, a six-way power driver’s seat, heated front seat, dual-zone automatic climate control and a leather-wrapped steering wheel and shift knob to complement the imitation-leather upholstery. The 2017 Mazda 3 Touring rides on 18-inch alloy wheels and also has a low-speed forward collision warning and mitigation system. It has a starting MSRP of $21,495. The package option for the 2017 Mazda 3 Touring, the Popular Equipment package, is only offered in sedan models. It includes a sunroof, a CD player, a nine-speaker Bose sound system, satellite radio, a rear lip spoiler and an auto-dimming rearview mirror. And while you might be wondering why only sedans get to enjoy the Popular Equipment package, don’t worry – only hatchbacks get the Touring 2.5 trim. Of course, that trim pretty much just upgrades the standard 2.0-liter engine to the 2.5-liter engine and throws in a sunroof for good measure. Finally, you arrive at the 2017 Mazda 3 Grand Touring trim. The Grand Touring trim includes everything from the Popular Equipment package plus LED foglights, a digital speedometer, and full leather upholstery. The Grand Touring also has the more powerful 2.5-liter engine. Additionally, there are two packages available with the Grand Touring trim – the Premium Equipment package and the i-Activsense Safety package. The Premium Equipment package includes LED taillights, adaptive LED headlights, LED daytime running lights, an auto-dimming rearview mirror, a navigation system and a heated steering wheel. The i-Activsense Safety Package adds advanced safety features such as lane departure warning, forward collision warning, adaptive cruise control and automatic high-beam headlights. If you’ve just read that list of amenities and assumed the 2017 Mazda 3 Grand Touring must be break-the-bank expensive, we are pleased to tell you that the starting price of the car is just $23,145. Of course, the price increases as you add the packages, but that’s the beauty of Mazda – even if you declined all of the package options, you’d still be driving home in a superior car. Mazda didn’t just spend all of its time figuring out how to get the most creature comforts jam-packed into its model and neglect to worry about safety. Quite the contrary, actually. The 2017 Mazda 3 is such a safe car that the Insurance Institute for Highway Safety named it a Top Safety Pick+ choice. The National Highway Traffic Safety Administration followed suite by giving the 2017 Mazda 3 a five-star overall safety rating. Coupled with the available advanced safety features, it’s easy to see why the 2017 Mazda 3 is such a popular family and commuter vehicle. 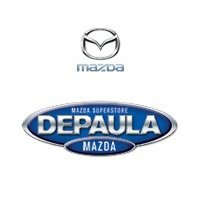 If you’re ready to come check out the 2017 Mazda 3 – or even if you’re interested in another Mazda model, come down and visit us at DePaula Mazda. Our vast inventory ensures that there is a Mazda just waiting for you. We’re open Monday through Thursday from 8:30 AM to 8:00 PM and Friday and Saturdays, 8:30 AM to 6:00 PM. We can’t wait to help get you into a 2017 Mazda 3!